The enemy of humanity | Fight Back! Inside one of the child internment camps. Fight Back! 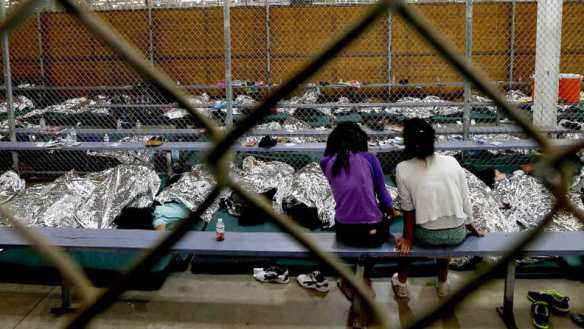 is circulating an essay by Elías Jaua, the People's Power Minister for Education of the Bolivarian Republic of Venezuela, on the current crisis on the U.S.-Mexico border caused by the Trump administration's ‘zero-tolerance’ policy towards migrating families. The article was posted in Spanish and translated to English by Fight Back! staff. “Imperialism exists and kills,” wrote our American writer Eduardo Galeano. And to the shame of humanity, we add ourselves. The atrocious images of children in detention centers, within the borders of the United States of America, are the brutal expression of a white supremacist system that dehumanizes all other human beings, anyone who is not them, who is different, who they consider to be nothing. Racist elites, in their desire to negate the existence of human beings that do not fit their physical and cultural parameters, are always in search of a “final solution.” Final solutions were the millions of human beings enslaved and martyred by colonialism in the invaded territories; the cremation ovens of the Nazi concentration camps; the death flights of Videla in Argentina; the “false positives” in Colombia; and now the jails of children within U.S. territory. The separation of children from their parents is an open violation of the International Convention of the Rights of the Child. To lock them in jails is a crime against humanity. This crime did not begin a few weeks ago, but has been happening for years. Only the “filtered” image has surprised the good people of this world, those that adore the “American way of life” and who have questioned those that struggle for an authentic humanity, who today are confronting a racist menace that we can no longer underestimate. Europe and the United States - the self-proclaimed guarantors of human rights, after provoking real humanitarian crises with terrorist bands in Africa and the Middle East, and economically pillaging the peoples of Mexico and Central America - have at their entry points millions of human beings, demanding the rights denied them in countries ruined by “humanitarian” interventions. The response of capitalism to the ensuing chaos is to return to concentration camps and to convert the Mediterranean Sea, the Gaza Strip and the Mexican border - among other corners around the world - into the great tomb of the poor of the 21st century. Imperialism lays itself bare as the enemy of humanity. Who will sanction the imperialists? That is the double standard of the so-called international community. This is what confronts the Venezuelan people every day. Today is the 197th anniversary of Carabobo, when white supremacist colonialism was militarily defeated in these blessed lands under the leadership of Bolívar. Compatriots, today calls us to fight the same battle. Bolívar continues on the front line and calls on us, as General Pérez Arcay, teacher of our comandante Chávez, always reminded us. Now we must fight with the ideas, innovation, production, and truly human ethics that differentiate us from the jailers of children and that allows us to rebuild and expand the stability and prosperity that we achieved in the first decade of this century, guided by our own socialist model. We must ensure that our land and our flag protects all of the children of Venezuela. They must find here the best conditions for individual and collective development. This is why we fight.